The pack is called From Ashes, and this bold bit right here is your call to stop reading if you're avoiding spoilers. I'm sensitive about spoilers; I don't like them. This one isn't exactly massive in that it doesn't relate to any character we've met so far, strictly speaking, but it could still stand as a bit of a wrecking ball for some. It doesn't for me and it might not for you, but I'm all for quarantine zones if you're running one. Have we all made our decision regarding whether or not to read on yet? I hope so. This your last chance to evacuate. Alright then! Now that we're alone, spoiler friends, here's the deal: on February 20th, a good few weeks prior to Mass Effect 3's March 6th launch date, a day-one DLC pack for the game called From Ashes popped up on the Xbox Live Marketplace. The pack contains a new character - a Prothean, no less - who you can recruit for your battle against the Reapers. How it wound up on Xbox Live early is unknown, though it's probably fair to say that it involved someone somewhere pressing a button at the wrong time. 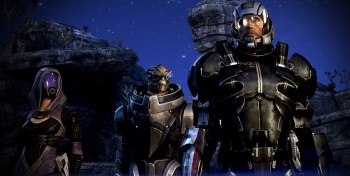 BioWare's Michael Gamble took to the company's forums to acknowledge the blip. "Hi all! We're happy to confirm that Mass Effect 3: From Ashes DLC will be available at launch for all platforms," he wrote. "For those of you who have purchased the N7 Collector's Edition (including the PC Digital Deluxe Edition), you will get this content at no extra charge. We'll have a lot more details for you later this week! Stay tuned!" So that about covers it, spoiler friends. My pre-ordered copy of Mass Effect 3: The Regular $60 Edition and I will keep an eye out for Gamble's promised "details" on From Ashes over the coming weeks if you're in the mood for more. In the meantime, I'm sure there are a few of you game for a chat about online passes, day-one DLC, and what this means for the market; come say hi. Update: With thanks to reader Soviet Heavy, here's a link to a YouTube video which claims to feature our new Prothean friend shouting about power conduits and "cycles," built up of files ripped from the demo. Dude's got a snappy suit too. Mass Effect 3 will hit shelves on the 6th of March 2012 in North America, and on the 9th of March in Europe.